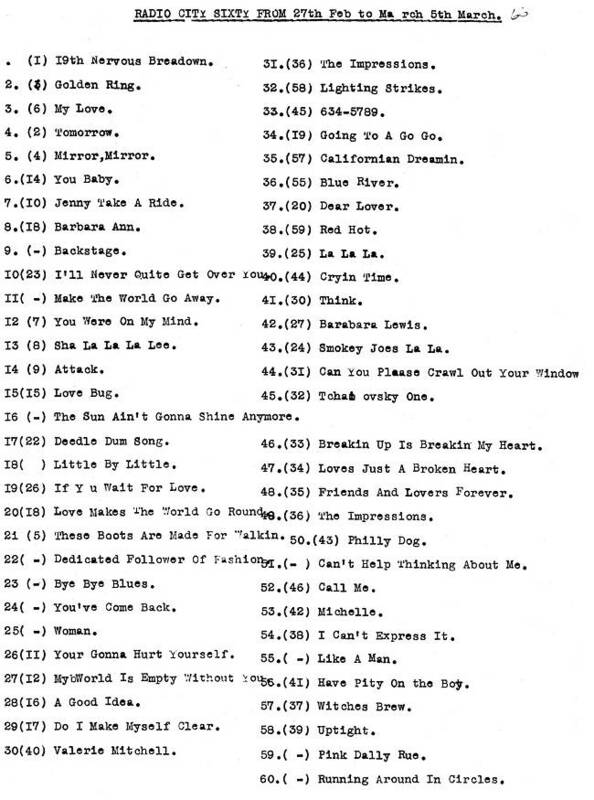 As before, the original document only lists the song titles or the artists, not both. We have attempted to fill in the gaps but, in some cases, have had to make an educated guess about which track is being referred to. If you spot any mistakes, please get in touch. Deon Jackson or Sharon Tandy ? The New Breed or Nancy Ames ? Lulu or Chris Montez ? David & Jonathan or The Overlanders ? * two records shown as being at number 18 last week. ** Last week's position is missing. *** The same record appears at no.31 and no.49. Next week's chart reveals that The Impressions should have been at 31 but doesn't identify what should have been at no.49. The Radio London Fab 40 and Caroline South Countdown for this week can be found on the Radio London website.